Those interested in Masonic research will be interested to know about the first Quatuor Coronati Conference held in the United States. 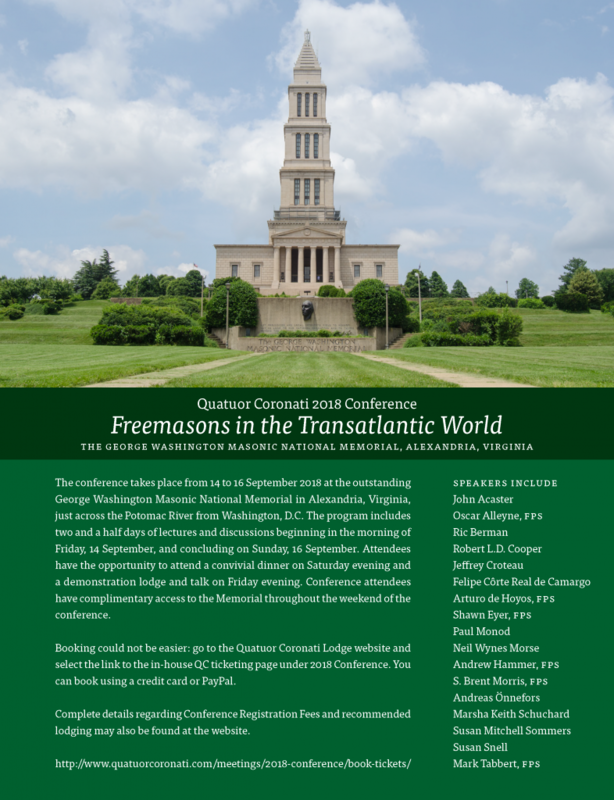 It will take place from 14 to 16 September 2018 at the outstanding George Washington Masonic National Memorial (where I work!) in Alexandria, Virginia, just across the Potomac River from Washington, D.C. The program includes two and a half days of lectures and discussions beginning in the morning of Friday, 14 September, and concluding on Sunday, 16 September. Attendees have the opportunity to attend a convivial dinner on Saturday evening and a demonstration lodge and talk on Friday evening. Conference attendees have complimentary access to the Memorial throughout the weekend of the conference. QC lodge is the global leader in Masonic research, and I expect this conference to be one of the most outstanding events of its kind. Anyone interested in the serious study of Freemasonry will benefit from attending. To register or for more information, visit the QC website. Hope to see you there!